The evidence to the contrary notwithstanding, it’s simply not the case that I select my leisure reading with a keen eye to the possibility of developing a theme for a blog post from it. And yet here I am again, with a copy of Matthew Pearl’s historical novel The Dante Club (2003) at hand. Set in Boston, Massachusetts, and its environs after the close of the Civil War, The Dante Club takes a historical episode of which I was ignorant—the controversial translation of Dante’s Divina Commedia by Henry Wadsworth Longfellow with the aid of a circle of friends, including James Russell Lowell (later one of Darwin’s pallbearers)—and interweaves it with a fictional mystery involving the gruesome murders of a number of prominent Bostonians in ways reminiscent of the punishments accorded to the sinners in the Inferno. Honestly, I had no idea when I removed the book from the shelf at the library that it would afford any fodder for the Science League of America. Were the transmutation theory true, the geological record should exhibit an uninterrupted succession of types blending gradually into one another. The fact is that throughout all geological times each period is characterized by definite specific types, belonging to definite genera, and these to definite families, referable to definite orders, constituting definite classes and definite branches, built upon definite plans. Until the facts of Nature are shown to have been mistaken by those who have collected them, and that they have a different meaning from that now generally assigned to them, I shall therefore consider the transmutation theory as a scientific mistake, untrue in its facts, unscientific in its method, and mischievous in its tendency. It seems a bit much to think that Agassiz would merrily participate in a public burning of the Origin—in a 1868 letter to Darwin he protested, “I have never expressed an unkind word concerning yourself”—or even of a pamphlet defending its views. (There was no book or pamphlet of that title ever published, as far as I can tell, and the adjective “evolutionary” is a little anachronistic, suggesting that Pearl invented the title.) 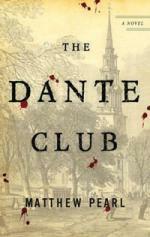 But The Dante Club is fiction, and I’m inclined to cut Pearl a bit of slack. The problem is the timing. Early in The Dante Club, Pearl writes, “Death was as common a visitor in 1865 Boston as ever,” listing a variety of causes of mortality, and ending, “and—until just six months ago—war…” There’s room to argue about when the Civil War ended: April 9, 1865, when Lee surrendered to Grant? June 2, 1865, when the last Confederate army surrendered? June 23, 1865, when the last Confederate general surrendered? In any case, the six-months-ago claim means that the events in the book can’t take place before October 1865. And that means that Agassiz wasn’t available for the bookburning. In A Journey in Brazil (1868), he explains, “In the winter of 1865, it became necessary for me, on account of some disturbance of my health, to seek a change of scene and climate, with rest from work.” He decided on Brazil, and departed from New York on April 1, 1865, not returning home until August 1866. Moreover, there was apparently no such bookburning. In the context of Pearl’s narrative, of course, the idea is to reinforce the presentation of the Harvard establishment as hopelessly hidebound, as committed to resist “the barbaric strain of foreign poetry embodied in Dante [in contrast to] the proven classical program championed by Harvard College for now some two hundred years,” as a college administrator writes (in the novel) to a minister he is recruiting to launch a preemptive attack on Longfellow’s translation. But just as there were Harvard professors, such as Lowell, already enthusiastic about Dante, so there were Harvard professors already enthusiastic about Darwin: not only the botanist Asa Gray (1810–1888), who famously arranged for the American publication of the Origin and published no fewer than three reviews of it, but also the anatomist Jeffries Wyman (1814–1874). Of course, the causes of both Darwin and Dante eventually prevailed.